This month Bluegrass Special marks the 40th anniversary of the Woodstock Festival, alongside the other signal events of 1969. Contributing Editor Billy Altman, who attended Woodstock, looks back on that memorable decade-ending summer when the world was first changed by the sight of a man walking on the moon a month before half a million young people descended on a farm in Bethel, NY, for three days of peace, love & music, as the posters proclaimed. Bluegrass Special’s cover subject this month is also celebrating an anniversary. 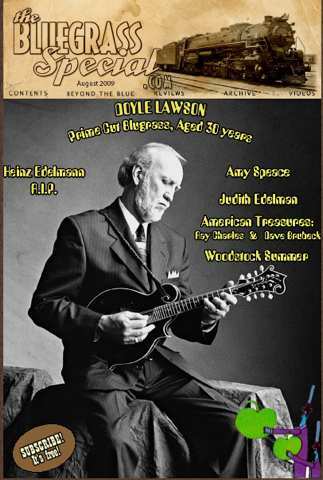 Bluegrass great Doyle Lawson marks his 30th year as a solo recording artist this year. In The Bluegrass Special.com interview, Lawson discusses his powerful new album Lonely Street, his early inspirations as an artist, and the work ethic he gained from his farmer father that he’s put into practical application in sustaining one of the most productive careers in bluegrass history.